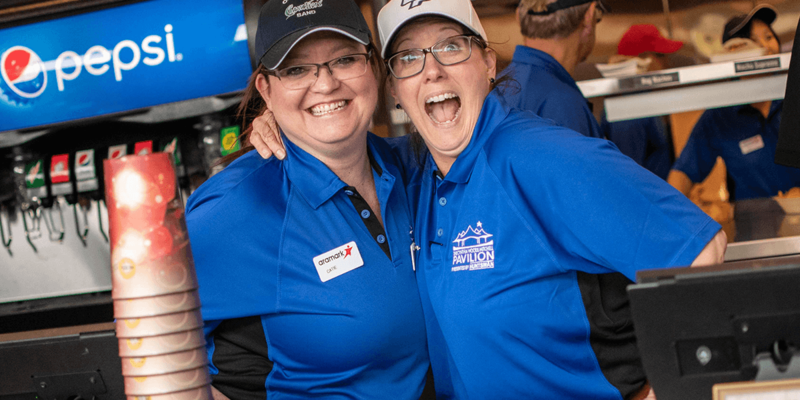 You've been rocking at The Pavilion for years, but do you know what's going on behind the scenes? Let’s level with each other here. You’re pretty sure you know what’s going on at The Pavilion. You’ve been to quite a few shows. You’ve seen all the legends – Tom Petty, KISS, Journey…the list goes on. You know the parking situation like the back of your hand and you could probably find the entrance at our North Gate blindfolded. Maybe you’ve even picked up on the fact that you can get through security a few minutes early if you come through The Pavilion Lounge. Moral of the story is, you’ve got this place locked down. What if we told you that there’s a lot more going on here than meets the eye? What if we told you that this place, the place you know and love as your summer home for the best concerts in the city, is also a thriving home for artists in training? What if we told you that profits from every show you’ve ever been to at The Pavilion have gone straight to providing Arts Education for the next generation? 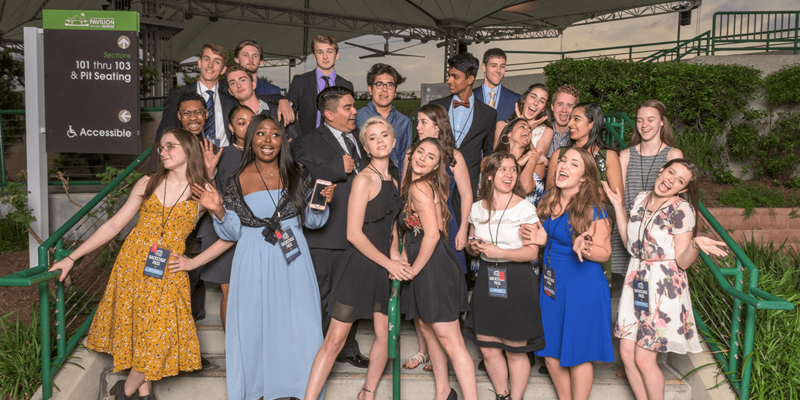 Each year, The Pavilion gives away thousands of dollars in Fine Arts Scholarships to students who are planning to pursue the Fine Arts at the University level and beyond. After a rigorous application process and two days of auditions, around twenty-five students are chosen as scholarship recipients. These students are hard-working, well-deserving and it simply must be said (you should watch these kids perform), extremely talented. Whether they win for their impressive body of work in the visual arts, their emotional monologues or their exquisite vocal performances, these students are unbelievable. The Pavilion comes to life when the scholarship applicants arrive for their auditions – there’s a buzz about the place that rivals the feeling of a sold-out show. This year our scholarship winners were celebrated with a reception on The Pavilion’s Main Stage. They received VIP treatment – complete with badges and a backstage tour. These kids are awesome and The Pavilion is thrilled to get to help them chase their dreams. Do you know what we miss most about Fourth Grade? The field trips. Honestly. We still have memories of touring places that seemed unimaginably big, of learning about new things in a hands-on way. It’s just special to experience a something that’s entirely new. That’s why The Pavilion put together Fine Arts Education Day: we believe The Arts are awesome and we want kids to think so too. Fine Arts Education Day brings fourth-graders from all over the local area to The Pavilion for (honestly) the best field trip ever. The world-class Houston Symphony takes the students on a playful musical adventure, guiding them towards a knowledge of the structure and beauty of brilliant classical music. Kids even have the chance to ask questions of the conductor in front of 5000 of their newest friends. 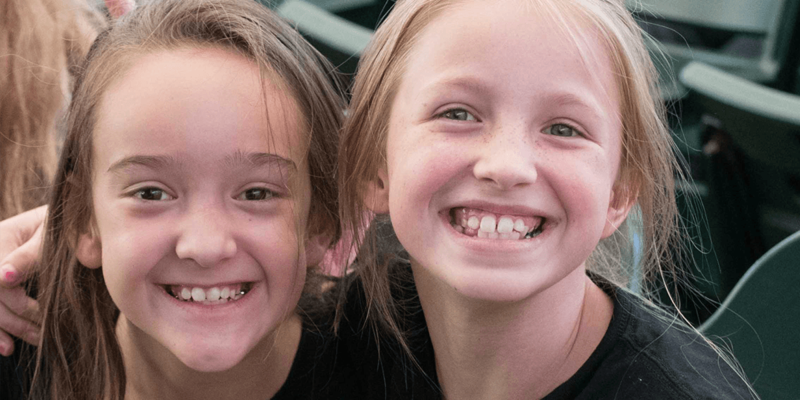 Our hope is that, as these kids approach Middle School and beyond, they’ll consider choosing a Fine Arts elective or extracurricular activity. Did we mention that this program is free? When we say that we don’t want anything to stand between kids and The Arts, we really mean it. We never, ever want the sound of beautiful music to leave our stage. Whether we’re rocking with Foo Fighters or hearing the Houston Symphony rock the Music of David Bowie, we want to make absolutely sure that our stage is jam-packed with a diverse set of talented artists all summer long. That got us and Pavilion Scholarship Winner Marie Daniels thinking – how can we make sure that in ten, twenty or thirty years, our stage is just as full and brilliant as it is today? Here’s what we came up with: We need to train the next generation of artists. From that idea, Chamberfest was born. It’s a week long, intensive summer camp that takes place at The Pavilion, backstage in our dressing room building. Marie Daniels and a team of talented teachers help Middle School and High School students hone their craft as musicians, while also preparing them for a life as a musical professional. 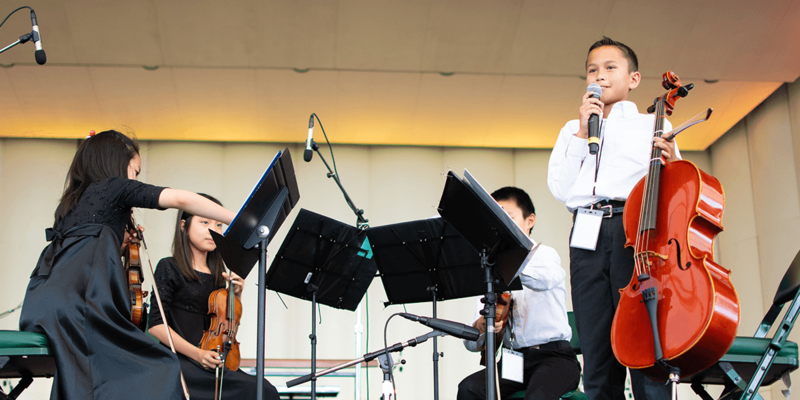 They take on subjects like public speaking and working within a team, all while learning challenging musical pieces that improve both their skills and confidence. School is hard, especially as a Middle School student. It’s tough to tackle a full set of classes, complicated friendships and all kinds of pressures. We think students who are able to meet the academic goals set by their teachers are well worth rewarding. In fact, we think they rock so much that they should get the chance to kick back in the sweet seats and see a show tailor-made for them. Enter Musical Scores. When students meet the academic goals set by their school’s faculty, they qualify to come to The Pavilion for Musical Scores. You guessed it – this program is free as well. The Pavilion is even able to help Title I schools cover transportation. This year, Street Beat left the students with a whole lot to think about. 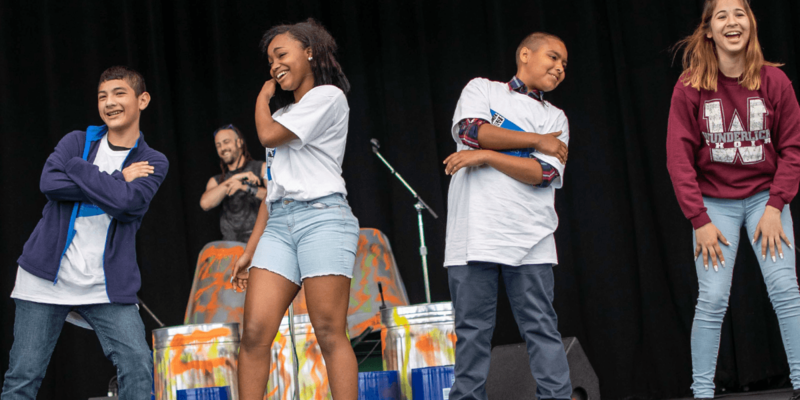 They showed off some serious dance moves, dropped beats on trash cans, paint buckets and whatever else they could find lying around, and even hosted a student dance competition on stage. You should see 5000 kids screaming at the top of their lungs as a fellow student dabs on our Main Stage. It’s a sight to behold. For a day, these kids get to leave everything behind and just laugh, dance and enjoy the show. We could be rocking with Lynyrd Skynyrd, dancing with Kesha or hanging out with Chris Stapleton – we just think our lawn is a great place to be. We also really believe that if people heard world-class classical music, live and in a beautiful setting, they might just fall in love with it the same way we have. That’s why at every single one of our Performing Arts shows, lawn and mezzanine seating is completely free. We want as many people to experience the wonder and brilliance of The Arts as possible. We open our gates wide and do everything we can to remove barriers that might stand in the way, so that friends from across our community can join us for a night of incomparable music. 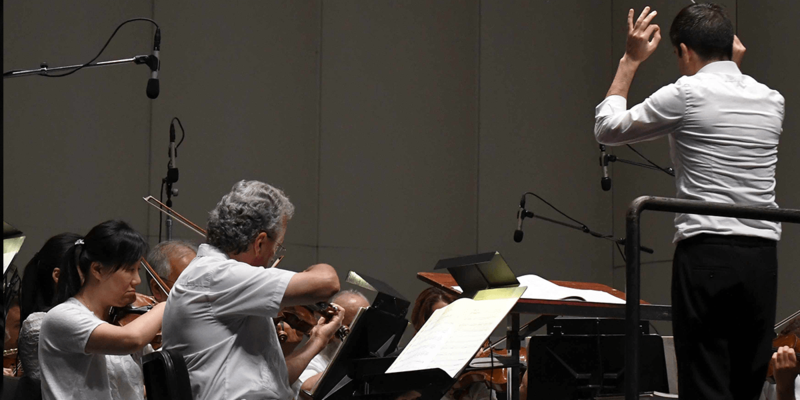 Through partnerships with the Houston Symphony, Houston Grand Opera and Houston Ballet, along with generous donations from corporate sponsors, we’re able to provide all the wonder of the best classical music Houston has to offer, completely free. 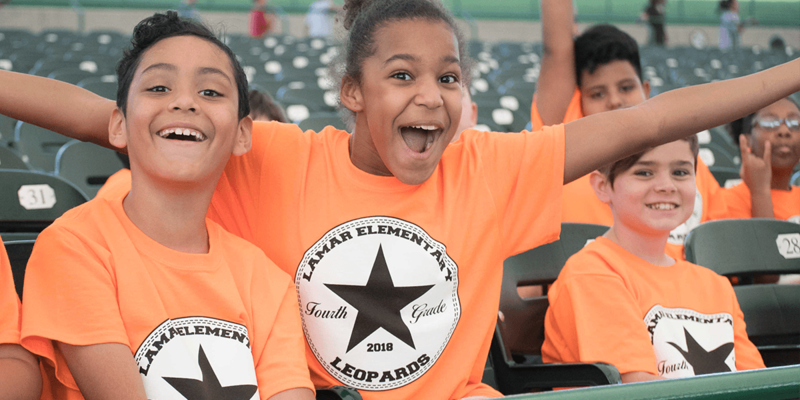 Did you know that when you buy a hot dog or a coke at our concessions stands, or even in our Woodforest Bank Club, a large portion of the profits go directly towards our Arts Education programs? That funding helps us give scholarships to deserving students, provide free seating at our Performing Arts Shows and put on mind-blowing field trips for local students. So here’s our advice: Keep rocking out with us. Keep singing along with your favorite artists. Keep experiencing new music. When you do, you make The Arts possible at The Pavilion. Maybe you’ve missed it before, but there’s a lot going on here. You’re probably already a part of it. The Pavilion is all about bringing The Arts to everyone in new and impactful ways. By coming to shows, you’re helping us do just that. P.S. Want to get even more involved at The Pavilion? Head here.